Informtainment.com by ORLANDO: Goom Radio: Create, share, enjoy! Goom Radio: Create, share, enjoy! 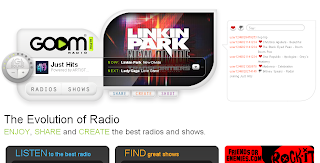 Creating your online radio program is becoming a little easier with Goom Radio. Yep, Goom Radio. The name sounds a little funny to me but I like what they have to offer. If you are a Caribbean DJ and would like to produce your own radio show, Goom Radio is the place to get that done. They are still in Beta stages, they will need all the Caribbean content they can get. The GOOM programmers and DJs have crafted each of our professional radios to not just play the music you know and love, but to also introduce you to new music you may not have heard, but will soon love. We mix that with shows and in-studio interviews, and even feature some partnerships such as "Rock-it Radio", where we've teamed up with our friends over at FriendsOrEnemies.com to bring you all things Alternative. If that isn't your style, check out "Pop Top 20" for the top songs and gossip of the day. Whatever your taste, we have like-minded folks here at GOOM who live it and will make sure you get the best of it. Listening is just the beginning. GOOM also gives you the tools to create your own radio. Be a DJ and influence your own mix, schedule your own shows and jingles, talk about the music that is important to you. Build and connect with your own audience, and share the passion you have for your favorite music. Soon, we'll even help you upload or record your own content. We don't want to force you to recreate your social network on GOOM. We just want to enable you to share your music with the friends you already have on your existing networks. If you have a blog, Facebook or MySpace account, or if you can't stop Tweeting, use our sharing tools to expose your friends to your favorite GOOM radio, especially if it is your own radio. We are really excited about what we have created here at GOOM, but it is just the beginning. We have some really cool stuff in the works. Please drop us a line to let us know how we're doing. We'd love to hear from you!